Why are two housing developments and a graduate school for social work important sites for many North Shore Jews? It’s because whenever they pass, they are reminded of the thriving synagogues that once stood there not so long ago. For the past few decades, as synagogue membership continues to fall, more and more have either closed or merged with others. “We’re in a recession, and synagogues are finding they have to work much, much harder just to stay in place,” said Jonathan Sarna, professor of American Jewish History at Brandeis University in Waltham. In the decades following World War II, Sarna pointed out, Jews left inner-city communities like Malden, Chelsea, and Everett for the suburbs, and the many synagogues that once existed there gradually disappeared as their congregants moved away. Now, as many younger Jews are moving back to the city, suburban synagogues also are beginning to struggle. Additionally, Sarna noted that as more congregants drive to synagogue on Saturdays, there has become less of a need for several synagogues clustered in close proximity. Finally, American Jews are less observant than they used to be. A study by the Pew Research Center found that just 19 percent said they attend weekly services. All of these factors have played out north of Boston. When a synagogue’s membership has decreased to a point that is unsustainable, it can either close altogether, or merge with a nearby synagogue. In a city like Revere, where a once formidable Jewish population has for the most part disappeared, the synagogue simply closed. Congregation Tifereth Israel was sold in 2015, and demolished in 2017 to make way for veterans’ housing. The congregation was founded in 1912, and enjoyed a heyday after the massive fire in Chelsea in 1908 brought many Jews to Revere. “I remember when I was a kid going to shul with my father and grandfather and uncles, and the place was packed – that was in the early ’50s,” said Ira Novoselsky, the former president of the temple. 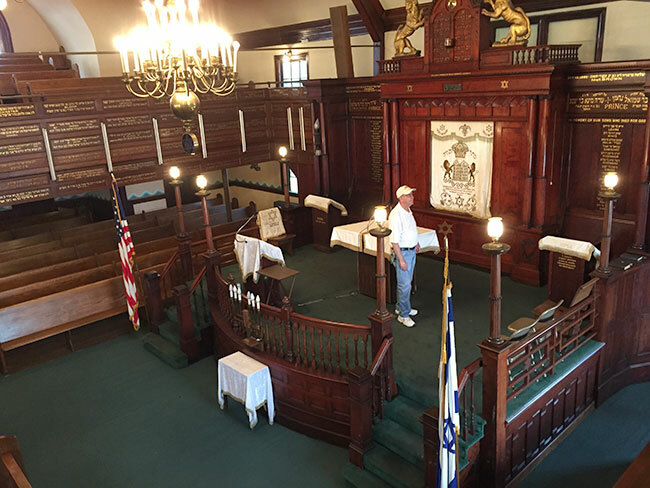 However, membership began declining steadily from the ’70s onward as Jews left Revere, and the temple was left without a rabbi or regular services. The board finally decided to sell the property in 2014, and Novoselsky spent the next year tracking down congregants and their families to give them photos, Yahrzeit plaques, and other memorabilia. “It was sad, but there was a sense that I knew we were saving as much as possible for people to remember,” said Novoselsky. Some of the original congregation remains. According to Novoselsky, about 100 former members still gather at the Chelsea Soldiers’ Home Jewish chapel for High Holiday services, which are led by Novoselsky’s son, Seth. In communities where there is still a viable Jewish community, struggling synagogues most often merge with healthier ones. On the North Shore, the Shirat Hayam merger created one of the largest congregations in the area. For many years, Temple Israel and Temple Beth El sat across from each other on Atlantic Avenue in Swampscott. Marla Gay, who was president of Temple Israel at the time of the merger in 2005, said that the temples had been in discussions for roughly 15 years, but did not finally decide to come together until their boards realized they would not survive unless a change was made. 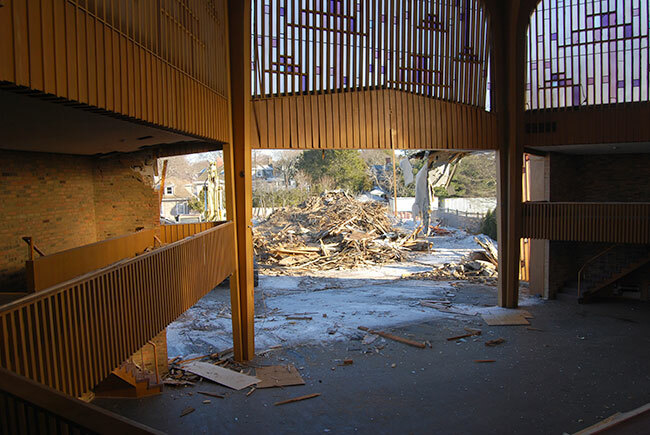 According to Gay, the new congregation was called Shirat Hayam – meaning “Song of the Sea” – because members wanted to create a new, revitalized community, rather than a combination of two old ones. The new congregation, housed in the Temple Beth El building right by the ocean, was somewhere people wanted to be. After the congregations merged and the Temple Israel building was sold, new personnel, an innovative Shabbat service, and a large-scale renovation brought in a flood of new members. which was demolished in 2017 to make way for veterans housing. In 2014, Temple Shalom, a longstanding synagogue in Salem, became part of Temple B’nai Abraham in Beverly. For over a century, Temple Shalom hosted a thriving population. However, more Jews were attracted to synagogues in nearby towns like Marblehead, Swampscott, and Peabody, and not enough Jewish families were moving into Salem. As attorney and current B’nai Abraham congregant Alan Pierce pointed out, Temple Shalom’s location on a busy city street meant that it couldn’t offer the same kind of parking that other synagogues could. After lengthy consideration, the committee decided to merge, and by a single vote, B’nai Abraham was the choice. As the merger went into effect, Cheatham estimated that a third of the Temple Shalom congregation came along, a third joined other synagogues, and a third disaffiliated altogether. Cheatham called the process of taking apart the synagogue “heartbreaking and soul-wrenching.” Many Torahs and plaques made their way to B’nai Abraham, and great pains were taken to ensure that the ark was brought to the Beverly synagogue, where it now stands in the lobby. In addition, a recently uncovered time capsule from 1952 has helped preserve precious memorabilia. The building that once housed Temple Shalom was sold to a local developer, who leases it to Salem State University to house its school of social work. A few architectural details from Temple Shalom remain inside the building.